Do you like super powers? Epic fight scenes? Highly dysfunctional families? Catchy 80s soundtracks? Well boy do I have a show for you. Netflix’s Umbrella Academy has it all. Umbrella Academy follows the lives of seven adopted siblings, who were all born on the same day to mothers who were not pregnant the morning before they gave birth, as they try to solve the mystery of their father’s death and save the world from impending doom. The show sets out to portray the negative side of super heroism, and how having powers can fully consume and ruin your life. Privilege isn’t always a good thing, and having super powers or growing up rich doesn’t mean you’re exempt to the sad parts of life. Umbrella Academy deals with heavy topics like drug addiction, grief, and cold parents in a light, comic and frankly weird fashion. The show is unique in the sense that there is not one main character, but seven. Each character is assigned a number (their dad literally calls them by their numbers), as well as a name which their robot mam gave them. Each of the seven main characters also have unique powers, which range from talking to and seeing dead people, to being super strong and travelling through time. The colourful soundtrack of the show acts as a character in itself. The only way to describe it is chirpy eighties tunes that you and your mam blare when you’re wine drunk. It features one hit wonders like Tiffany’s ‘I Think We’re Alone Now’, as well as seventies classics like The Doors’ ‘Soul Kitchen’. Add some Queen, some Radiohead, some Noel Gallagher, as well as a track from the writer Gerard Way, and you have a dance worthy soundtrack. The music often contrasts the scene itself, with intense action scenes being accompanied by upbeat anthems. Also, if you love dance scenes like me, Umbrella Academy blesses us with a few Breakfast Club worthy moments. 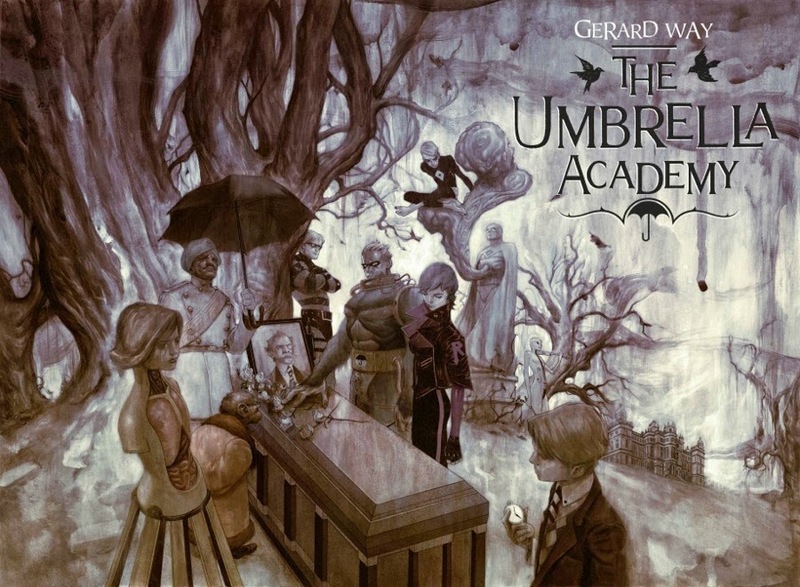 A good soundtrack is expected of the show when we consider that Gerard Way, lead singer of the now disbanded My Chemical Romance, wrote the Umbrella Academy comics on which the show is based. Gerard Way has a lush history of creating complicated and other worldly universes in which to base stories on, as any fan of his music would know. Each of My Chemical Romance’s albums were based on a concept, and each song furthered the story. From the murder spree that their second album is based on, to the journey of dying that their third album is based on, it’s quite apparent that Gerard Way has a vivid storytelling imagination. Umbrella Academy was his first venture outside of music, and therefore his first story that wasn’t told through music. However, his genius still shines through, as he created complex characters, numerous original plot lines, and managed to put a unique spin on the world of super heroes. The production itself is fantastic. The show is laced with little easter eggs for those familiar with the writers and the comics, and each episode presents the title of the show in a different way. The show features a fair bit of brilliant and believable CGI (one of the characters is a very posh talking monkey in a suit), as a science fiction type show would require. The costuming is good too, each character dresses in a fashion which compliments their personality. For example, Robert Sheehan’s character Klaus (a very erratic and unpredictable drug addict) alternates his closet between a leather skirt and a pair of questionable leather trousers with a strange leather cut out. Overall, the production is very personal to the show, and between the donut shop set and the mansion in which the seven main characters live, the setting itself is interesting and colourful.